There is a cycling experience called the bonk. It's what happens when you ride too long without food, or didn't have enough breakfast to begin with, and the brain decides in the space of around 5 minutes, to reserve the remaining blood sugar for itself. It essentially says the rest of the body can look after itself until fat conversion gets into gear, which takes a long time. It feels rather like you are beginning to die. 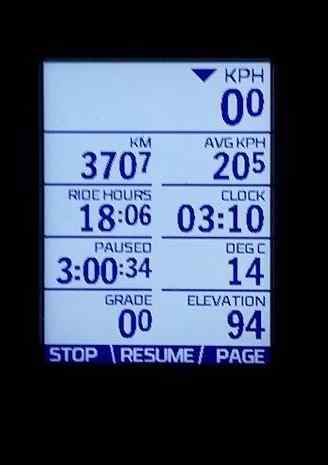 I planned to use this year's Tour Down Under Community Ride as a springboard for a 400km day, and more if I still had the legs. If I start in the crowd at my average speed ranking of around 20 – 25kph, I find I post a really quick time for my age, but am then a bit burned for the rest of the day— something about the psychology of keeping up with those around seems to mess with my head. So I begin at the very back of the crowd. Sometimes I've ridden out behind the ambulance. I soon begin to pass the very slow riders, especially when the hills start, but it's just enough of a mind-hack to help me maintain an appropriate long distance pace. On Saturday, everyone rode off without me. 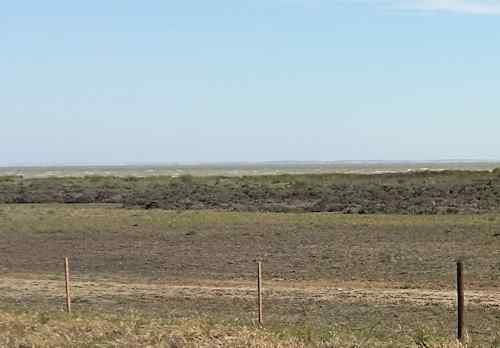 I was the last rider all the way down to the Southern Expressway, and on the gentle rises past Sturt Road, had begun to wonder what was wrong with me. 500 metres up the expressway I knew I was bonking, despite the hefty breakfast I use when I'm touring. It's happened once or twice before; the body seems to decide the last meal didn't happen, I feel a bit tired, and then suddenly... bonk. I pulled off the expressway— 7% at this stage— and broke out the sugar. Which meant I nearly had to fight off an official with a stick, because he thought I was about to die, or something. By the top of a very slow hill, I had stopped shaking. 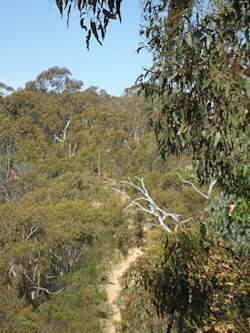 By Noarlunga I was clear I was not going to vomit, and by Sellicks Hill I began to feel normal, apart from being excessively tired. 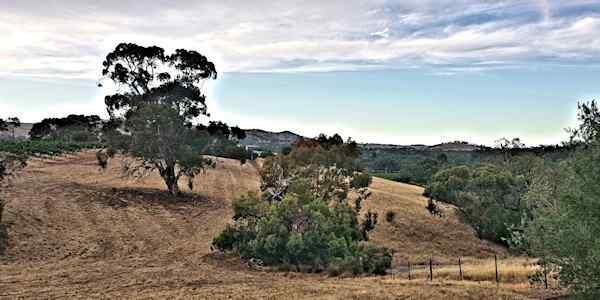 Only from Yankalilla did I begin to pass the back markers— meaning the blokes over 75, and a few other pudgy fellows who plainly make the TDU their one ride of the year which goes much more than 25km. It always takes a while for the blood sugar to turn around, for the shock to finish, and for any energy for effort to return. And I find that too much sugar at once can have its own unpleasant consequences, which you don't need me to describe here. I was going so slowly that it already felt like I was doing a solo ride; there was no one in sight. I had accepted that I would end up waiting 45 minutes somewhere on the side of the road while the pro peloton came through, and that would mean I'd have trouble making 400km in the 24 hours, especially since I had been going so slowly. They have RFID receivers just past all the water stops, and as I arrived at Victor Harbor— still last— I head the bloke in charge of the RFID reader there telling the refreshment folk that there were still 40 people between Inman Valley and Victor! There must have been a lot of people in the cafes at Yankalilla when I trundled through! I also heard that the projected arrival time of the peloton meant I should make Strathalbyn before them. In the event, as I left Strath, the peloton was still on the road! 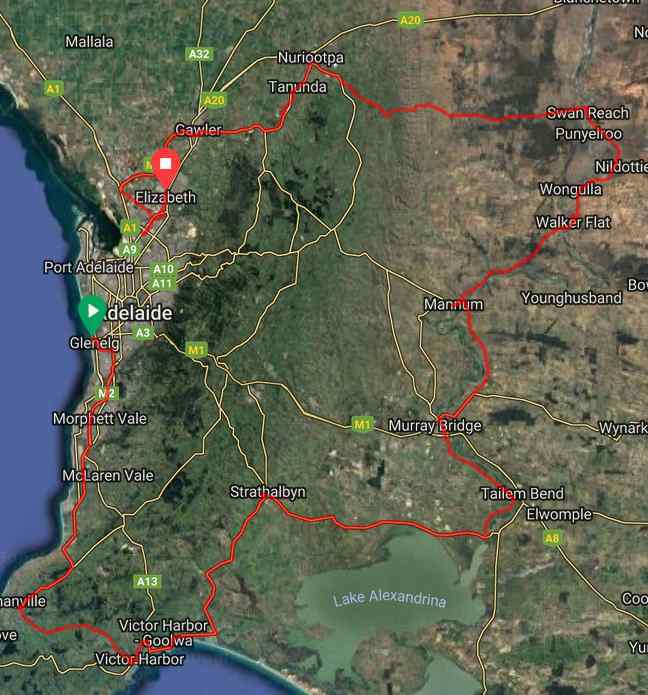 The Strathalbyn section was 160kms, which I covered at 20.4kph road speed and 18.7kph including the stops. It's remarkable how good these speeds were, given how sick I had been feeling. They reinforce my feeling that 75% of a long ride is in the mind, and that if you simply follow the nutrition and recovery rules, a whole lot of stuff can be "ridden through." I stocked up with extra water at Strathalbyn, bought some lunch, and headed off to Wellington. The plan was to follow the river from there up to Swan Reach. Wellington also meant turning out of the wind and back to the tail wind we had from Victor to Strath. The tail wind was good for speed, but bad for flies, as I crossed the dairy country up through Jervois. A Subway wrap never tasted as good as the one at Murray Bridge, with the young woman quite unruffled by a bedraggled cyclist also purchasing litres of water and chocolate milk. There is a certain constancy about bottled water which is worth the small expense on these rides. The river towns have taps that are not necessarily treated water, and there is no riding through the consequences of that! 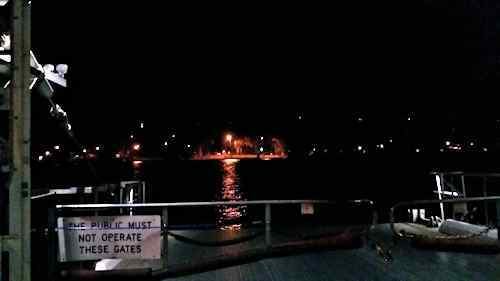 Nothing is open at night, and I was glad not to need the water I collected from a tap in Sedan as a precaution; the recycled water warnings near the taps are worrying! It's an interesting climb into the hills here. My old GPS has a battery saving function which does slow satellite pinging, and means that grade readings are often understated. With the new Wahoo, I was seeing spots of 11%, which helped understand why this climb is so bloody hard at the end of a long day; in the dark it's very hard to estimate gradient. The wind was roaring down the gullies, and I could see the switchback climb traced out in reflective signs across the slopes ahead. I jumped off at one stage and walked at 5kph instead of riding at 6! This headed off an old back injury which had begun to remind me of its presence. Apart from the geese and other birds, I had seen no wildlife, apart from rabbits, until I met a slightly surprised wombat just before Sedan. We observed each other for a few seconds until he toddled off in the bush. This meant I'd been lulled into a false sense of security during the hills through to Angaston, and nearly copped a roo. By which I mean locking up both wheels as it passed in front of me so close that I'm not sure how we missed each other. I said to a friend that if I'd been down on aero bars, I'd have been snotted by the top of its head! At 395km, it would have been a nasty anticlimax to be brought down by a roo. Arriving at Sedan I still had 3 hours to do 30kms, which should be a doddle. The shock of the hill is seen in the fact that I did the first 10km in 8 minutes over the hour. 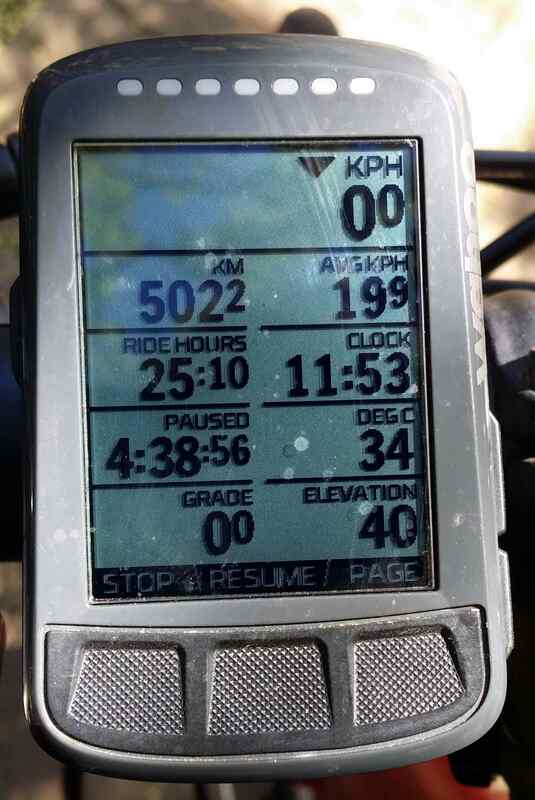 But by the time I made 400km at Angaston, I was 45 minutes in front. I'm a couple of years older than when I used the Coast to Coast to launch 400km over much of this route and did the 400 in only 19:13hrs. I suspect the fast Coast to Coast run from Mylor to Victor Harbour helped on that trip, but the times also tell the tale of seeing off the bonk. It was now about 70 kms to home. 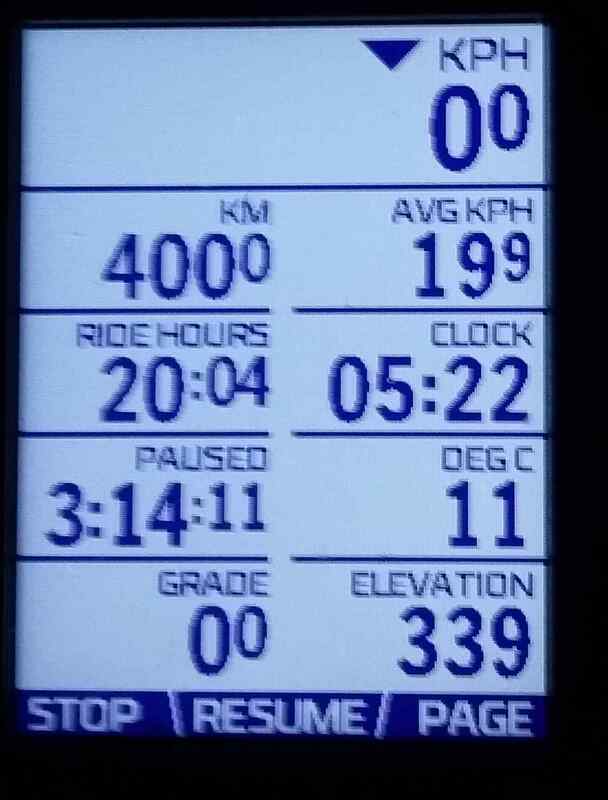 I had planned on a loop up to Kapunda from Nuriootpa in order to bring up 500km on the trot, but after breakfast in Nuri, I lazed down the bike path to Gawler and then the SOG, and did a few back street loops near home to bring up the distance. My last effort at this distance took 29:08 hours, and required a nap in the main street of Jamestown. This time I took 29:40 for 502km, and I think I'm feeling a lot less exhausted— so far, anyway. You can see this trip at RideWithGPS here.